Tintri builds smart storage for virtualization and cloud environments that enables IT teams to focus on virtualized applications and hybrid cloud environments instead of storage. The application-aware storage sees how applications behave at the virtualization layer and optimizes storage performance for each one. Tintri makes it easy for IT teams to focus on performance, quality of service, speed of deployment, and scalability of their virtual infrastructure. The Tintri Management Pack for vRealize Operations (vROps) provides VM-level storage statistics, trending and insight that makes managing and troubleshooting performance issue in virtualized environments and private cloud deployments a breeze. Instantly Diagnose VM Performance Issues: Tintri simplifies performance bottleneck troubleshooting by providing instant visibility from the host, network and storage. Eliminate finger pointing and guess work with the ability to see VM-latency breakdowns at any infrastructure layer – host, network, and storage. Quickly Understand Storage Details: Tintri enables operators to quickly verify whether applications and VMs are protected according to SLAs for recovery point objectives. With per-VM level illustration of snapshot metrics, operations teams can quickly verify whether applications are over/under protected. Gain Visibility into Key Performance Indicators for Replication: The ability to deliver per-VM WAN-efficient replication is a powerful capability that reduces storage and network consumption by minimizing redundant data movement. Tintri exposes replication information to vROps administrators which allows them to validate that both VM and application data are efficiently replicated to an alternate VMstore. 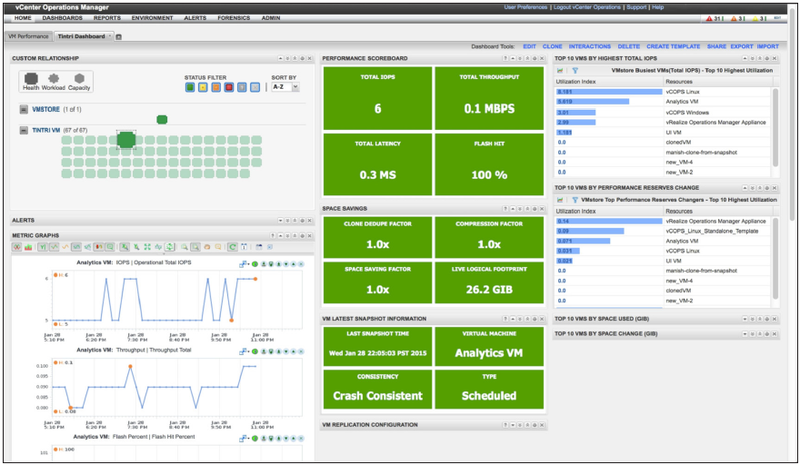 See & Understand Virtual Machines Better With VMstore Dashboards: Tintri integration with vRealize Operations Suite (vROps) delivers performance, capacity, and trending metrics of Tintri VMstore into a common cloud management platform enabling operations teams to work more productively with both applications and infrastructure teams. 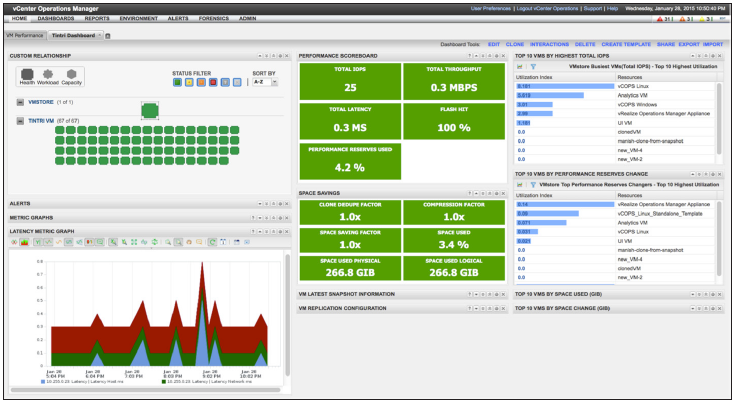 Tintri brings a unique storage view to operations teams with one-toone mapping of storage to an individual VM and pre-configured dashboards that identify VMs with the most changes in performance or capacity utilization. Performance metrics such as performance reserve, available capacity, and IOPS can be easily viewed. Leverage vROps Badges With Tintri Insight: Tintri leverages the vROps badges which allows operations teams to setup flags on insights such as latency, throughput, performance reserve, storage details such as capacity, VM count, and hardware details such as error messages and failed components. View Relevant Trending Activity: You'll make better decision with insight into trends. Tintri storage makes it easy for you to understand which VMs are consuming the most storage and I/O resources because it maps storage directly to individual VMs, regardless of where the VM lives. Tintri visibility and vRealize trending combined enables you to alert application, storage, or network teams of unusual activity with concrete information that lets them take action quickly. Insight in Minutes: Just like Tintri storage, the vROps Management Pack can be installed and managed in minutes by any administrator who has credential access to a VMstore appliance. Relevant Inventory Summary: Operations teams can view summary VMstore characteristics such as VMstore OS version, serial number, IP address, model number, up-time, and top changes. Offers Precise Automation: The Tintri automation toolkit enables administrators to automate tasks using information from specific VMs or an entire VMstore using via PowerShell or REST API. Download the Tintri Management Pack for VMware vRealize Operations Datasheet (PDF).